You are currently browsing the archives for the Politics 08 category. Hat tip to LA buddy for this one. Drudge has yet to link to swirling reports, including on Andrew Sullivan and Wonkette, that Sarah Palin’s husband’s ex-business partner made emergency filing for a seal on his divorce papers. Update: here’s the docket chronology. Update: Drudge was right to pass: no smoke, no fire. The last week has seen a huge surge in traffic on political blogs. DailyKos, which six months ago was doing 12 million impressions a month is now doing 20 million impressions a week. And Wonkette , which does 4 million impressions some months, did nearly 800,000 impressions last Friday. (Turns out Wonkette has been watching a little known Alaskan politician for two years.) 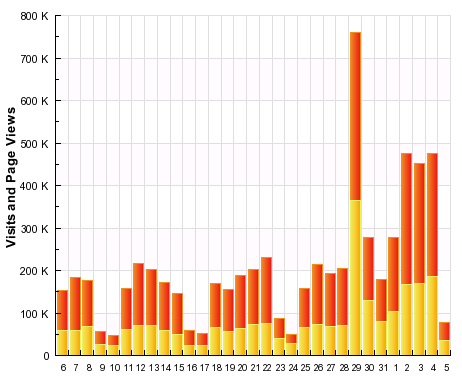 Here is Wonkette’s recent traffic. John McCain deserves credit for turning the ’08 race upside down by putting Sarah Palin in a position to be just a heart-beat away from leading the free-world. Having said that, as a small business owner, I’m appalled by reports that McCain only interviewed Palin once. At our company, even interns — folks who will work for us maybe 10 or 20 hours a week and make $12 an hour — get interviewed at least eight separate times over the course of six to eight weeks. I interview each possible intern hire at least twice myself. In taking so much time and effort to vet potential junior hires, we’re not focusing on our immediate needs. We know that diligent up front vetting is the smartest investment we can make in the future. Not every person we hire works out, but we vastly increase our odds of success with scrupulous hiring. Does the USA not deserve at least the same level of due diligence that we apply to interns for a possible future president? One interview — if that’s what happened — wasn’t bold. It was reckless. I regret not being in Denver tonight but hope to watch it on TV. Wow, I hadn’t realized how much Obama was rocking Twitter. John Accarrino has the numbers. Update July 29, 2008: Here’s some context for McCain’s bitterness about the press turning its affections towards Obama.